Eventhough I really love this addon, is this normal? --DEBUG FIXME - We should really try to avoid having OnUpdate on every frame. An event when going in/out of range would be greatly preferred. 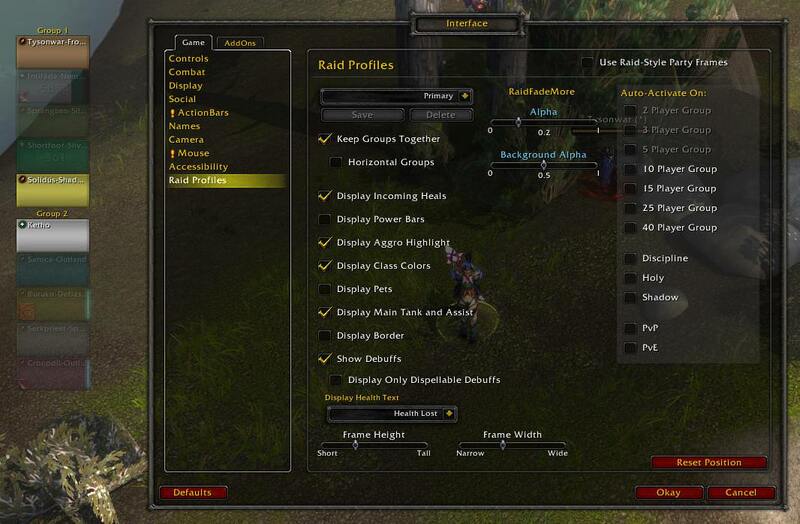 Do you mean just the RaidFadeMore options or the whole Raid Profiles panel? Well gotta double check then, i was in a raid group but in dalaran not in a raid instance like antorus or BG's (it was just to test if i can see the fade options). I tested with ElvUI and the options showed up for me at least. Did you try disabling all other addons to see if any are interfering? Are you by any chance using HideRaidFrame? Ohhhh I finally managed to make it work :D sry for disturbing and thx for your answers, great addon ! One of the best WoW addons, thank you! - Is there any way to show the raid bars when you are going solo? You have no idea how much I wanted this addon, thank you! It would be a cool feature if this addon also faded the little widget attached to the left side of the window. Have an option to fade on mouseover. That way it only shows up when you move your mouse on top of it. Hey really nice addon! love this, been looking for something like this since i dont use the other raid addons. 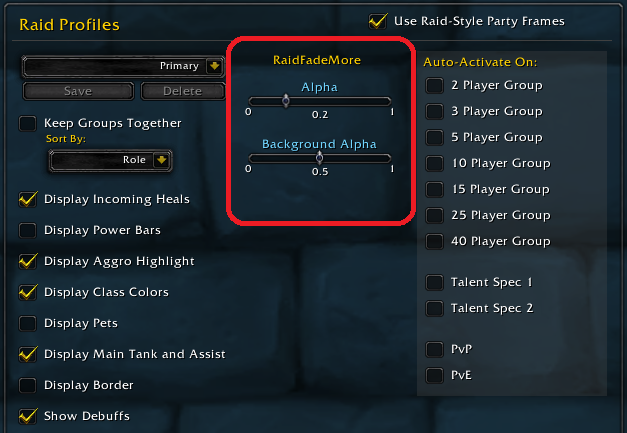 RaidFadeMore is already updated for WoD. If you meant that it doesn't show as updated for 6.0.3 instead of 6.0.2, it doesn't really make a difference. Only if for example, patch 6.1 is released, then it will need an update. Oh cool thats alright thanks man! i've already shared this addon with a few friends and they love it too. Just wondering if you could put in an option for the names to still stay solid? One of my friends suggested that if the names stayed solid just so its easier to read out when in the middle of a raid or pvp ground we atleast can call them out? What are your thoughts on this. btw again, awesome addon! will keep sharing it around.